The album is due out on April 27. Post Malone has confirmed details of new album Beerbongs & Bentleys, due out April 27. The album features the singles "Rockstar" f. 21 Savage and Ty Dolla $ign collaboration "Psycho." Also on the 18-track project is "Ball For Me" with Nicki Minaj, "Spoil My Night" with Rae Sremmurd's Swae Lee, and a track with YG and G-Eazy. That's the album art above. 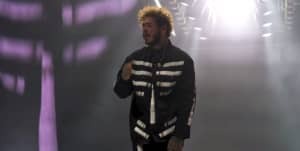 Beerbongs & Bentleys follows his 2016 debut album Stoney. Thumbnail image courtesy of Rich Fury/Getty.